Since 1977, Kitco has been buying and selling silver bars and other physical precious metal bullion products. Silver investors often sell silver bullion bars to us given our competitive live silver bar prices and due to the high level of trust we have earned over the last +40 years of conducting business around the world. We offer silver bullion holders an easy way to sell 10 oz silver bars of .999 fineness live on our website. We have automated much of the silver selling process to make selling silver bullion bars easy, safe, private, and efficient. There is no minimum amount required when selling 10 oz silver bullion bars to Kitco either online or over the phone. 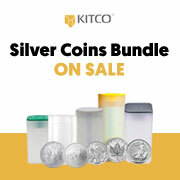 For additional details, please read Kitco silver selling FAQs by clicking here. Call us at 1 877 775-4826 or 514 313-9999 to arrange your free silver shipment pick-up. At Kitco, we make it easy for you to manage your physical wealth portfolio including when you are ready to sell 10 oz silver bullion bars. You can buy or sell silver bars, or other physical precious metal items, by using our convenient online store, or by contacting our team of highly trained precious metal specialists. Kitco is a trusted leader in the silver bar and physical precious metals industry. Silver bullion bars and other precious metals sold to Kitco are recognized in silver bullion markets around the world. With our focus on silver bullion, you can benefit from our competitive silver bar prices and premiums that are highly within the silver bullion industry. At Kitco, we make it easy for you to manage your tangible wealth. You can buy or sell silver bullion and other precious metals using our convenient online store, or by contacting our team of highly trained precious metals specialists. Backed by our global information network, Kitco has proudly served our customers since 1977.